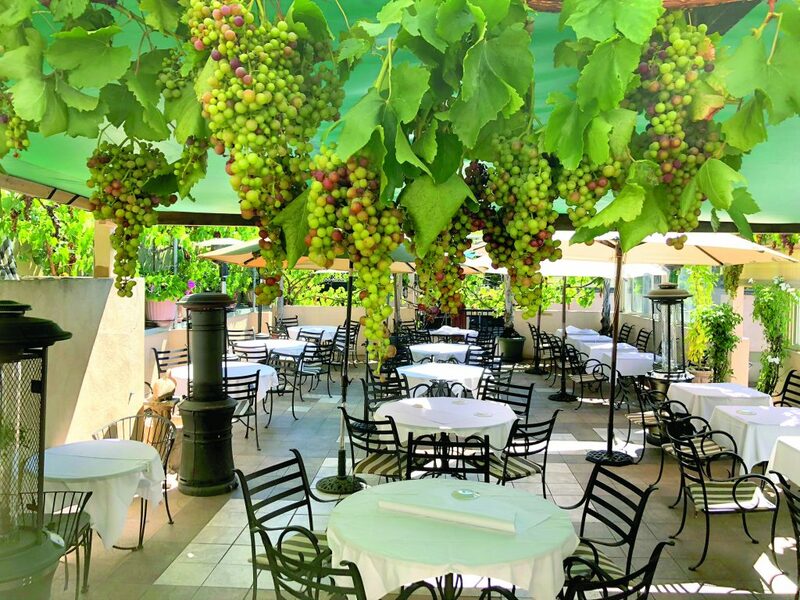 Trellis Restaurant is where seasonal Italian food with a California flair is served with élan and style. In addition to beautiful surroundings, Trellis offers seasonal menu items and vibrant daily specials. With its stunning rooftop patio surrounded by real grapevines for al fresco dining, it’s truly a unique dining destination.Located in trendy Menlo Park, where large gleaming windows offer a view of the street outside and a mirrored wall offers a bird’s eye view of the social scene. It is elegant. It is friendly. The two-story restaurant looks small as you enter but don’t be fooled, it offers three private dinning rooms and a full bar on each floor perfect for your holiday party. In contrast to many restaurants that only offer a three- or four-course prix-fixe menu, Trellis offers a large menu with a rich variety of appetizers, salads, pastas, entrees, desserts and wines. Their menu can satisfy any appetite and accommodate special diets including salt-free, vegan or gluten-free needs. Food is prepared when ordered and is made to your taste. All desserts, breads, soups and sauces are made in-house from scratch using only fresh, local seasonal produce, meat and seafood. The chef does all his preparations in-house, such as the daily sauces, deboning of fresh fish, portioning meat and pounding veal. The wine list offers a handful of wines from Italy, with the rest primarily from California. For a delicious appetizer, the owner highly recommends the Carpaccio di Venezia, thin sliced raw beef with diced red onions, capers, parmesan cheese and mild Dijon mustard, or the sauteed prawns with garlic and white wine lemon sauce. If you’re a pasta lover, you must try the Fettuccine Carbonara with pancetta and peas in a light cream sauce. The warm spinach salad, beet and orange salad is also highly recommended. If you are looking for protein, the excellent Steak au Poivre will not disappoint. Two medallions of filet mignon with cracked black peppercorn crust and brandy cream sauce are served with gratin potatoes. Other stars of the menu include the Sonoma duck breast with an orange thyme sauce and daily fresh fishes. And don’t skip dessert – the options are delectable and delightful. Try the delicious fluffy zabaglione warm or cold, or have the tiramisu or spumoni, and you’ll definitely leave satisfied. Trellis doesn’t use any artificial flavor or MSG in their freshly cooked meals. Trellis Restaurant has served the people of the Peninsula for the last 17 years under the same ownership and chef, which is rare in the restaurant industry these days. Their success in a tough Peninsula restaurant environment is based on their reasonable pricing, consistency and excellent food and it’s the perfect place to hold your special or holiday events. Wether you come for lunch or dinner, here is a place for dinning in grand style. Trellis Restaurant is open Christmas Eve, Christmas Day and New Year’s Eve. Restaurant is located at 1077 El Camino Real in Menlo Park for reservations or call (650) 326-9028.